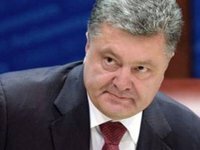 Possible attempts to stop Ukraine's entry into NATO and the EU would violate the Ukrainian constitution, considering that such membership is formalized by the fundamental law and is mandatory for all power branches, Ukrainian President Petro Poroshenko told the press during his working visit to France. Poroshenko reaffirmed his commitment to the European choice of Ukraine. "We have paid a high price for doing that. The sacrifices made by the Ukrainian people must not be wasted," he said.